Could an unstadium in Los Angeles consign the America’s Cup match to Italy? 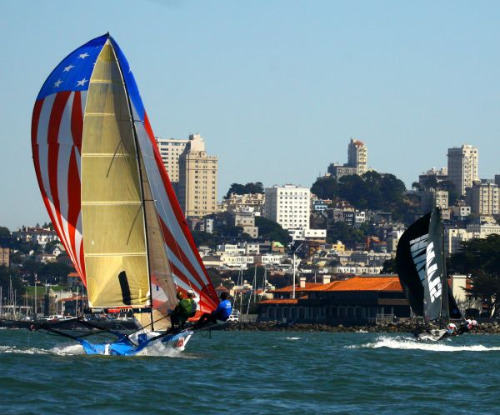 Could a Chevron refinery in Richmond, California consign the America’s Cup match to Spain? Is it possible for everybody to pull in one direction, and go nowhere? These are important questions. Less important—Did a former weightlifter/actor show Russell Coutts his Conan the Barbarian sword when the CEO of BMW Oracle Racing called at 1303 10th Street, Sacramento, following what my spies tell me was a longish session in Room 200, City Hall, San Francisco? What’s been playing out in the last week and a half since the BOR team came to town and asked the city of San Francisco to hurry up and produce a plan and a proposal and certainty by September 30 –yes, Virginia, and all your little friends, Larry Ellison really does want to schedule an America’s Cup match for San Francisco Bay, 2014—but, as I was saying, what’s been playing out is not quite Kafkaesque, and yet it does bring into focus the reasons why you’re never a fool to be pessimistic about getting things done in San Francisco. Ultimately, however, this is about defending America’s Cup in America. That’s why I still believe it will happen. 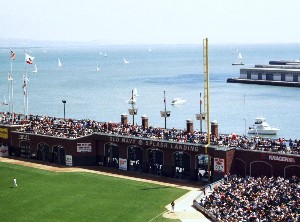 The teams will be based at Pier 50, directly down-camera from every Giants game, and how cool is that? If environmental groups and neighborhood NIMBYs prevent that, and cost the region the $1.4 billion of revenue and 9,000 jobs estimated to come with an America’s Cup, they’ll have a lot to answer for. 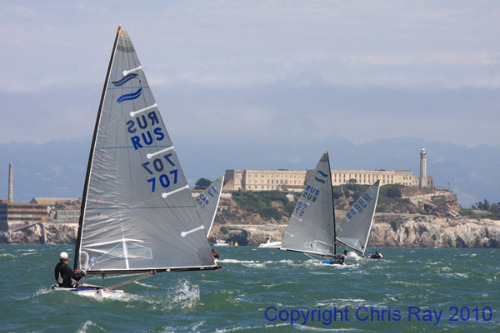 The sport of sailboat racing will lose. But the environmental groups too say they want to see the America’s Cup sailed on San Francisco Bay. Everybody says they want to pull in one direction; the issue is process. Then Pandora peered into the box and . . .
There’s big money on offer in Italy. There’s infrastructure in place in Spain (where the sailors get a tailored tax break that they really, really like). There’s noise coming out of France and Portugal. And here we are in a cash-strapped city in a cash-strapped state, starved for the benefits that a Cup would bring, poised to achieve failure while all parties agree on the goal. And that would, truly, be Kafkaesque. The easy thing would be for Larry Ellison’s team to take the money and race in Europe. Not because he needs the money, but because the Europeans will simply make things happen. He’s not taking the easy route for any number of reasons. He lives here. He learned to sail here. He sees that cameras love San Francisco and San Francisco Bay. 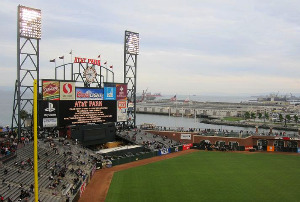 This is the place for a transformative America’s Cup match. And it would not be pleasant for an American to announce that he is defending America’s Cup, elsewhere. BOR needs a commitment from the city before it too can commit. The team has asked to see a proposal by September 30, after first running December 30 as the storyline for a venue announcement. They are beset by anxious would-be challengers who are tugging at them from all sides, and everyone wants to move the ball. The hurry-up message, however, prompted a hurry-up plan from the mayor’s office that drew all the environmental/neighborhood issues out of the woodwork and spilled them onto the floor. That plan suggested delivering Certainty quickly by going to the California State legislature—which closes its session on August 30—to gain an exemption to the California Environmental Quality Act, aka CEQA. Pronounced seequa. This was done for the Los Angeles Olympics in 1984, and it would cut through much, not all, of the red tape and environmental review that, otherwise, spell delay. But the proposal proved a call to arms for environmental organizations. They say they support an America’s Cup on San Francisco Bay, but not an exemption to CEQA. To them, CEQA is the holy grail. A CEQA exemption may or may not be where we’re headed, but the hurry up message and the CEQA flare-up have had the power to “concentrate the mind wonderfully,” so to speak. A little power play here, a counter power play there, and pretty soon you define the outlines of the situation. 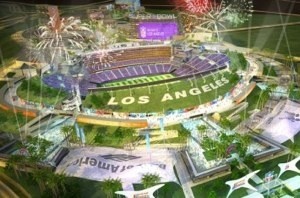 Toward the close of the 2009 legislative session, California legislators hastily granted an exemption so that Los Angeles could rush to secure a bid for a new NFL team and then build a stadium in the City of Industry. So far, no team and no stadium. “Plus,” says Lewis, “Chevron’s Richmond [California] refinery is in Sacramento trying to get an environmental exemption. That creates its own atmosphere, and for legislators outside the Bay Area, the America’s Cup is not a priority. A week ago, when I first heard that the mayor’s office was thinking about this, my own thought was, let’s find another way to give the team confidence. I’m optimistic this can be done, but my optimism doesn’t matter in the context of a compressed period of time. Which depends in part on the decision to go mono or multi, doesn’t it? And that decision also turns on the no-later-than date of September 30. But that would leave it a bit sporty for the Defender, with the chance that some odd impediment might pop up. Here is where we are testing the creativity of Michael Cohen and testing the creativity of the environmental groups, and g’bless. I seem to remember tremendous difficulty surrounding the building of a new baseball park, now acknowledged as a gem. And here we are, August 2010, with Mayor Gavin Newsom’s office estimating a huge positive impact for the regional economy and everybody agreeing that America’s Cup 34, for the good of all, ought to be sailed on San Francisco Bay in 2014, and for all that we’re wringing our hands in fear that we can’t get there from here. Larry Ellison built a software empire by being smart, and by being adventurous. He won the America’s Cup last February in what we might call a hostile takeover. As it began, there was absolutely no guarantee of success. The man is not risk averse, but in declaring a venue for America’s Cup 34, he is betting for all the players, not just for himself. This is a historic moment for the America’s Cup. The Defenders propose to create a new competitive/media regime that, if successful, will become a new tradition with so much force behind it that the next winner will simply have to carry it forward, even though it is not enshrined in the Deed of Gift. It’s time, past time, for that. But the heart of the America’s Cup tradition is the premise that the winner wins the venue. It was an upstart Yankee schooner, remember, that won a big, silver trophy in 1851. She raced around the Isle of Wight, and our upstart schooner was sailing against the entire fleet of the Royal Yacht Squadron at a time when Britain was the empire of might. And why did Britain have an empire? Because Britannia ruled the waves. Plenty of folks back home in the former colonies had expected the Yankee schooner to suffer a humiliating defeat. Instead, the English lion was bearded in his own den. It took 132 years for a team from another country to take away America’s Cup. When a boat named Australia II finally became the first foreign winner, in 1983, there were plenty of Australians saying, “It’s Australia’s Cup now.” But that was just talk. The name did not change, because the prize itself is nothing unless it is the America’s Cup, the oldest trophy in sports. The Aussies did, however, take an unofficial national holiday. An American team carrying the colors of an American club simply has to defend America’s Cup in America. The last time I checked, the Golden Gate Yacht Club fit that description. If rumor holds true that BOR hopes to stage a pre-event on San Francisco Bay along about a year from now, we know they’ll be doing it without finished infrastructure at Piers 30/32 and 50, but the sooner we start, the better. On KQED’s Forum, McClellan pointed out that Piers 30/32 went through a full environmental review early in this decade when they were being considered as a cruise ship terminal. NOTE: The above is extremely edited in an attempt to expose the core of the conversation and does not at all reflect how it felt or sounded at the time. I’m taking a risk, but I think I got it right. This might also prove an opportune moment to repeat myself: A little power play here, a counter power play there, and pretty soon you define the outlines of the situation. So there is the welter, and your speculation is as good as mine as to which of Michael Cohen’s “parallel courses” might work out, or will the team allow some wiggle room on that September 30 date, and will the creativity of the environmental groups measure up to their professed enthusiasm. Footnote to the post that won’t end: Michael Cohen, director of the mayor’s Office of Economic and Workforce Development, resigned on Friday, one day after completing a deal to transfer Treasure Island from the US Navy to the city of San Francisco. Cohen has had the lead in the city’s negotiations for an America’s Cup deal, and his known talents were one of the factors in favor of success. He has said that he will stay in the saddle until the end of September. Still here? Go outside and play. 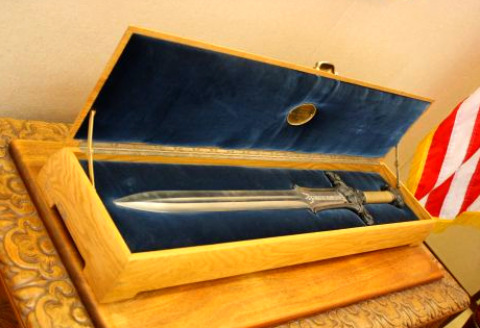 Oh yeah, Conan’s sword . . .